Collectors of quality knives may be looking for different features in their accumulation of these definitive weapons. Collected knives may be iconic production brands, vintage knives, or ‘one of a kind’ artistic knives handmade by artisans. While an iconic production knife is nice to have, and vintage knives hold value, there is nothing that says “special” like an individual handmade item from an expert craftsman. A custom, handmade knife from your most revered knife maker may become your ‘Holy Grail’ knife, that is, one you study and lust after, which when finally obtained becomes the pinnacle of your collection. These knives are made one at a time, and it can take the professional crafter up to a month to complete a piece. 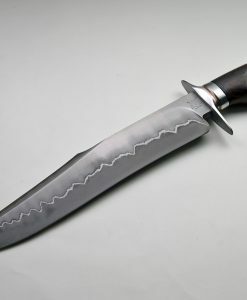 Knife designs can be one-off, custom requests, or reproduced on demand in limited numbers. There are many top knife makers in this niche, but some stand out above the rest, here are a few of our favorites. 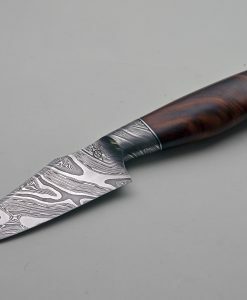 Charlie Bennica, a toolmaker by trade, began making knives in the late 80s, and first exhibited in 1996. He quickly became a recognized leading knife maker by striving for perfection, working on each separate aspect of his knife design and function, developing mechanisms and finishing techniques, and learning from other masters in his field. He was invited to Art Knife International (AKI) in 2013 and has exhibited in the following two years, 2015 and 2017. His designs feature perfection in operating mechanism, alongside ergonomics for full functionality as a tool. 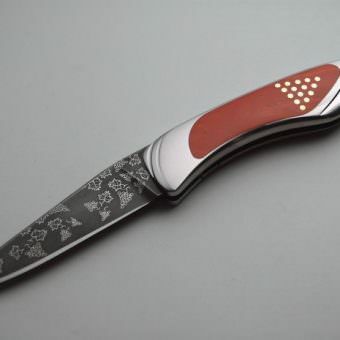 Primarily stainless or composite blades, he often works with top artists for individually engraved handles or insets carefully styled precious and semi-precious materials. Michael, a jeweler, first tried his hand at knife making in 1975 when his wife gave him a Gerber knife and a copy of American Blade. Despite his artistic background, Walker designs are famous for their mechanical efficiency, and his patented Walker Linerlock has become an industry standard. Most of Walker’s designs are balanced crescented foldable styles with discrete artistic insets. Walker has partnered with some production knife makers to make copies of his designs more accessible. Walker has been invited and attended AKI since 2007. 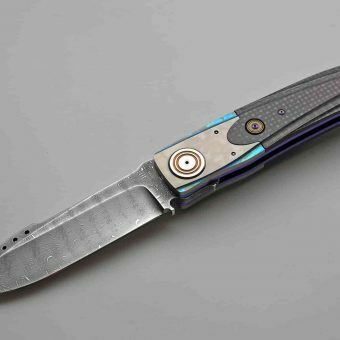 Owen began making knives in the early 70s, and became South Africa’s first professional knife maker, founding the Knife Makers’ Guild of Southern Africa in 1980. He has exhibited in the US since the early 80’s and was an invitee at AKI in 2015 and 2017. Owen’s knives feature an integrated balance between the materials of the blade, handle, and integral symbiotic designs. Geometric inset shapes, some with art deco inspiration, feature different materials and sit alongside smooth mechanical functions as central features of Owen’s designs. 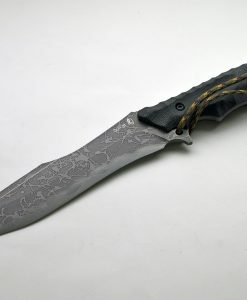 Designs are usually made of Damascus steel. 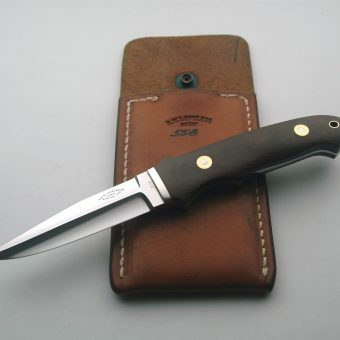 No list would be complete without mentioning Bob Loveless knives. One of the original custom knife makers, he began selling custom-made knives in the 1950s. 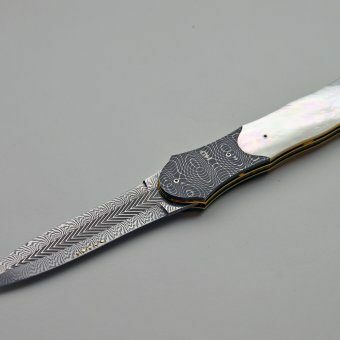 During his career, he taught many knife makers and allowed his designs to be copied and mass-produced for the benefit of making them available to more people. Many prestigious manufacturers and entities have commissioned his designs, including the CIA. He participated at AKI from 1993 to 2005, stopping only shortly before his death in 2010 at the age of 81. Loveless knives are highly functional knives of impressive quality. Bob even refused to stamp his knives as he feared it would interfere with the strength of the blade, preferring to acid etch the signature.